Publisher's note: We at Global Perspectives have long been interested in health risks of long exposure to computer screens and "Blue Light". Now we see that Apple Computer and other companies recognize the risks to vision and are finally taking steps to reduce the "Blue Light" exposure to people, particularly when working on computers or with cell phones for long hours, or at night, when the light from screens appears to be concentrated. Our thanks and credit to Dr. Mark Dunbar, OD, and Ronald Melton, OD, who published this article on line. Read it, and then take steps to "filter out" blue light with special reading glasses, sit further away from your screen, and take other steps, such as not reading cell phones in a dark room. Millions of people are experiencing faster degeneration of vision, and this is an item not to be taken lightly. We run this article as a public service. BBB, Publisher, BootheGlobalPerspectives. Dr. Dunbar has disclosed the following relationships: Allergan Optometric Advisory Panel, Carl Zeiss Meditec Optometric Advisory Board, ArticDx Optometry Advisory Board, Sucampo Pharmaceutical Optometry Advisory Board, Vision Expo Continuing Education Advisory Board East and West: 2005–Present. Dr. Melton disclosed having direct financial and/or proprietary interests in Alcon Laboratories, Bausch + Lomb, ICARE-USA, Jobson Publishing and Nicox. 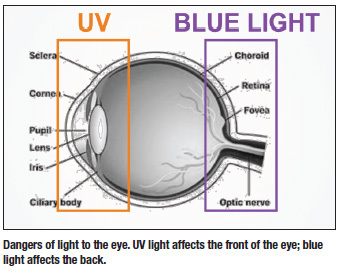 Blue light, which is part of the visible light spectrum, reaches deeper into the eye and its cumulative effect can cause damage to the retina. Furthermore, in certain wavelengths, blue light is implicated in the development of age-related macular degeneration (AMD).1–3 The amount of exposure to blue light varies, depending on the time of day, the location and the season. The average proportion of blue light that's found in sunlight during the day is between 25% to 30%. Even on a cloudy day, up to 80% of the sun's UV rays can pass through the clouds. UVB is between 280 nm and 315 nm, and has more energy. It is more energetic and fairly damaging if we're exposed to it on a day-to-day basis. Acutely, it can cause sunburn and destruction of vitamin A. In more chronic forms, it can lead to skin thickening, wrinkling and possibly damage to DNA, which can lead to melanomas and other skin disease. So exposure to UVB is cumulative to both the body and the eyes. UVC is in the range of 100 nm to 280 nm, and is the most biologically active of the UV light. Brief exposure can create permanent damage to human tissue. Fortunately, UVC is absorbed mainly by the ozone layer in the upper atmosphere. As baby boomers age, there's an increasing incidence of cataract and macular degeneration cases in the United States. In 2012, there were approximately 24 million cases of cataracts in people aged 40+ the United States,6 which is a 19% increase from 2000 numbers. For macular degeneration, two million people aged 50+ had late AMD in 2012,6 which is a 25% increase from 2000. By the year 2050, the cataract population is going to hit 50 million, whereas AMD tops off at around 5 million, it's estimated.7 So the bottom line is that cataract and AMD cases are expected to double over the next 30 years, in part because of the aging of the population. Essilor had a partnership with Paris Vision Institute in 2008 and their directive was to find the bands of visible light that were the most harmful to the eyes.10 They split the visible light into multiple bands of 10 nm and each band was then focused on porcine retinal pigment epithelial (RPE) cells for several hours. So using this method, the specific band of blue light most harmful to the retina and to the RPE cells was identified to be at 415 nm to 455 nm. Who's going to need the most protection? Those who have high exposure to white LED or fluorescent light bulbs in offices and homes, frequent users of LED computer monitors, tablets, or smart phones, and those at risk for AMD, particularly those at high risk, (those with family history, smokers, etc.). Vision Problems in the U.S.: Prevalence of Adult Vision Impairment and Age-Related Eye Disease in America, Fifth Edition. Prevent Blindness America, 2012. Available at: www.preventblindness.org/vision-problems. Accessed: December 2013. National Eye Institute. Available at: http://www.nei.nih.gov/eye-data/cataract.asp. Accessed: December 26, 2013. We have an aging population that will result in a growing demand for eye care. With that, we can expect to see more patients with age related macular degeneration (AMD). And even though 90% of our patients have dry AMD, a large percentage of those patients could develop the wet form of the disease. I look at this as an incredible opportunity for optometry to monitor these patients, take care of them, and really be their primary eye-care provider. This comes with the responsibility of knowing when to refer, in addition to making the appropriate recommendations for our patients. All of this is a critical role for optometry, and thanks to the latest technology, there's so much we can do to help change the outcome of AMD. We now understand that genetics play a critical role in AMD, and that environment and lifestyle factors also play a role. We know that those who smoke have up to a 16 to 20 times higher risk of developing AMD and that those with higher body mass indexes, poor diets and greater ultraviolet (UV) light exposure are at an increased risk.1 So it's really that interaction between genetics and those external factors that predispose a person to go on to develop macular degeneration. But there's a lot that we can do to make sure that the genetics don't take over, and we'll talk about that a bit later. We've evolved to the point that we can do genetic testing and identify patients who have the highest risk of going on to not only develop AMD with a high degree of certainty, but those who are going to progress to the wet form of the disease. I think it's an exciting time for our patients now that we have sight-saving treatments, as well as a great opportunity for optometry, because with advances in technology, we can closely monitor and take better care of these patients. As our understanding of AMD has evolved, we recognize that it's almost this "two-hit theory." You may have "bad" genetics or a series of genes that predispose you to AMD, but that doesn't necessarily mean you'll go on to develop macular degeneration. There are other factors that I view as being the second hit. Maybe it's smoking, poor diet as well as other lifestyle factors that trigger various genes to interact and ultimately predispose you to develop macular degeneration. Perhaps it's even as simple as living in an area where there's a lot of sun exposure or working outside a lot and not taking the necessary precautions to protect yourself from the sun. Photoreceptor cells are triggered by light to set off a series of electrical and chemical reactions, and this process begins at birth. In the retina, the retinal pigment epithelium (RPE) aids the photoreceptors by providing enzymatic re-isomerization of the daily turnovers of photoreceptor disc membranes. A marker for dysfunction in the RPE is seen clinically as drusen, altered RPE pigmentation and accumulation of lipofuscin. Lipofuscin in particular is a highly autofluorescent retinoid that accumulates when the aging RPE is unable to completely digest the outer segment disc membranes. Simply put, it is a marker for disease activity. Lipofuscin is most easily seen with fundus autofluorescence (FAF) imaging. 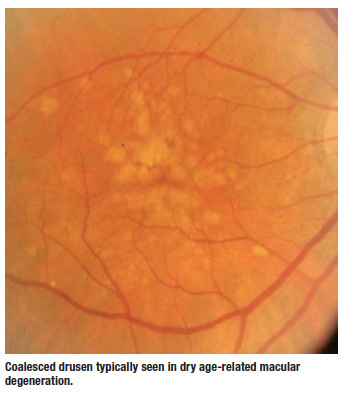 Drusen are the earliest clinically detectable feature of dry AMD. They lie between the basement membrane of the RPE and Bruch's membrane. Hard drusen tend to be smaller and can also have a calcified appearance, whereas soft drusen are larger and more ill-defined. Sometimes they coalesce and resemble small serous detachments. These are the ones that worry me most. When I look at these patients clinically, I always try to ask myself if I see any fl uid, subretinal hemorrhages, exudates or elevation of the retina, as these are red fl ags that the patient may have progressed from dry AMD to the wet form of the disease. Sometimes in these patients, it is difficult to determine whether they have converted to wet AMD based solely on the clinical exam. This illustrates, in part, the importance of looking at the macula three-dimensionally, as some of the retinal changes can be very subtle, especially with a patient who still has excellent visual acuity. Viewing the macula stereoscopically can help detect some of these subtle changes that are indicative of a patient who has progressed. Fortunately, in the era of OCT imaging, detecting these early changes is much easier. As a clinician, you don't have to rely as much on your clinical skills and ability, which, in some patients, isn't enough. There are times when OCT imaging is an absolute necessity to pick up some of the early changes to which we have already alluded. The OCT allows you to make earlier diagnoses, which in turn leads to better and more appropriate referrals. Geographic atrophy (GA) is a less common form of dry AMD. Once again, we've been helpless in monitoring these patients because we haven't had a treatment. However, now with a better understanding of genetics and other factors that affect this disease, a number of new treatments are in the pipeline that will hopefully not only stop progression, but also possibly result in a cure for AMD. The treatments currently available have revolutionized how we manage and treat AMD. In fact, any more, some argue that macular degeneration isn't the leading cause of blindness. Thanks to today's treatments, many of our patients are actually enjoying better acuity and consequently, better quality of life because they are able to read, drive a car, and other important tasks. The downside is that sometimes a patient's condition requires a monthly injection. However, if you've seen a patient who has received injections of any of these drugs, you know that they typically tolerate them well and that the outcomes are very good. Keep in mind that we are looking at the secondary effects of a lifetime of exposure to light, a lifetime of faulty genes, a lifetime of diet and other factors that can ultimately be detrimental. Conventional treatments aside, what about other approaches to managing AMD? Does making lifestyle change make a difference? Can it prevent the development of macular degeneration? We know that it can in other diseases such as diabetes and hypertension, so it's a fair question to ask in the setting of AMD. Certainly we can talk about quitting smoking with our patients, but what about making dietary and nutritional recommendations? At the time of the first AREDS study, we didn't have available to us the carotenoids lutein and zeaxanthin, but we did have beta-carotene, and so that was the one that was studied. Now, however, lutein and zeaxanthin are available—so would substituting these carotenoids for beat-carotene make a difference? One would think so, considering that the macula contains larger amounts of both of those carotenoids as well as meso-zeaxanthin. This was one of the initiatives of the AREDS2 study, which evaluated the effects of lutein and zeaxanthin in place of beta-carotene on the progression of AMD.4 It also looked at the effects of omega-3 fatty acids, which was also believed in other studies to play a role in the progression of AMD. The point of the study was to answer in a randomized, controlled clinical trial, whether there is a benefit to lutein and zeaxanthin, as well as the omega-3s, alone or in combination with other nutrients, on slowing the progression to macular degeneration. AREDS2 randomized 4,000 patients aged 50 to 85 who are at high risk of having advanced AMD to one of four groups: placebo (original AREDS supplement); lutein and zeaxanthin only; fatty acids only; and lutein and zeaxanthin plus fatty acids.4 Unlike other studies, AREDS2 looked at patients who had intermediate and advanced macular degeneration, rather than those who didn't have AMD or who had early macular degeneration. The placebo group in AREDS2 consisted of patients from the original AREDS trial, with the beta-carotene, zinc, vitamin A, C and so on. Everybody else was randomized to these other forms of nutritional supplements (see figure above). 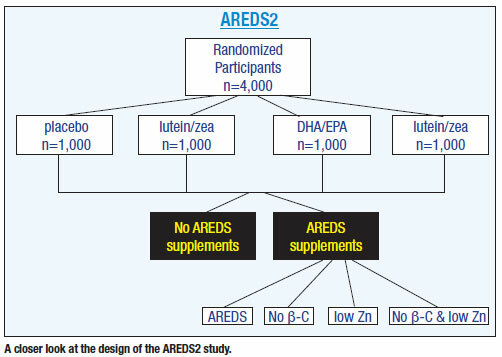 AREDS2 sought to find out if adding lutein and zeaxanthin, adding omega-3 or a combination of the two to the original AREDS formulation reduced the risk lower or beyond the original 25%. The data did not demonstrate a signifi cant reduction in the progression, which was surprising. The secondary analysis revealed a 10% reduction in progression to advanced AMD when compared to no lutein + zeaxanthin (not in addition to the original 25%). There was also an 18% reduction in progression to advanced AMD in subjects who received the AREDS supplement with lutein + zeaxanthin in place of betacarotene compared to the original AREDS supplement. Furthermore, a 26% reduction in progression to advanced AMD was noted in the lowest quintile of dietary lutein and zeaxanthin intake. The study concluded that lutein and zeaxanthin did not add any more benefit than what beta-carotene did. However, because there is a higher risk of lung cancer in smokers (or previous smokers) who were on beta-carotene, lutein and zeaxanthin would be a safer substitute. Finally, it was also determined that the omega-3s didn't have any beneficial effect. When we look in particular at treatments for the dry form of AMD, nutritional therapy is really the only treatment that has been shown to reduce the risk. Certainly, lifestyle changes have a benefit, so I think it's our role as primary and secondary care eye-care providers to recognize the potential of environmental and lifestyle changes, to talk about nutrition and diet and quitting smoking, but more particular perhaps, recommending specific lens types that will block the harmful effects of UV radiation and high-energy visible light before these changes ever develop. Dr. Dunbar serves as the director of Optometric Services and the optometric residency supervisor at the University of Miami's Bascom Palmer Eye Institute. He has authored numerous papers and is the writer for Review of Optometry's monthly column "Retina Quiz." Coleman HR. 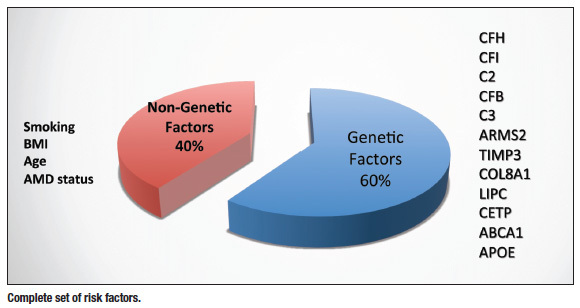 Modifi able risk factors of age-related macular degeneration. Pages 15-22. In: A.C. Ho and C.D. Regillo (eds. ), Age-related Macular Degeneration Diagnosis and Treatment, 15 DOI 10.1007/978-1-4614-0125-4_2, © Springer Science+Business Media, LLC 2011. Available at: http://www.springer. com/978-1-4614-0124-7. Accessed: January 2014. Age-Related Eye Disease Study Research Group. The Age-Related Eye Dis ease Study Group: design implications. Control Clin Trials. 1999:20(6):573-600. A randomized, placebo-controlled, clinical trial of high-dose supplementation with vitamins C and E, beta carotene, and zinc for age-related macular degeneration and vision loss. AREDS Report No. 8. Arch Ophthalmol. 2001;119:1417-1436. Age-Related Eye Disease Study 2 Research Group. Lutein + zeaxanthin and omega-3 fatty acids for age-related macular degeneration: the Age-Related Eye Disease Study 2 (AREDS2) randomized clinical trial. JAMA. 2013; 209(19):2005–15.